Making you feel comfortable, and ready to workout. Strive Fitness Club gives its clients the high-quality intimate atmosphere so needed in a GYM which is like a second home for its members, making you feel comfortable, and ready to workout. We wish to invite you to come and checkout the new modernly designed club including luxury workout facilities, high-end spaces, classes and spinning hall, and to get to know us, as well as the gym's special vibe, the home-like atmosphere, our ultra-wide variety of classes, and our convenient work hours (6Am – 11:30Pm). All of the instructors at Strive are highly professional individuals, offering their experience, knowledge and skill at your service throughout the club's working hours. We invite you in, to persistently adopt a healthy life-style, improve your fitness levels, strengthen your muscles and develop a firm and beautiful body. We offer special tailor-made programs for individual trainees, working one on one or in groups, combined with a diet built according to your needs and goals by a professional dedicated dietitian. 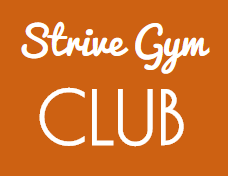 Join Strive Fitness Club members today, and start enjoying your benefits. High-energy High-speed strong and intense full body workout on a high-tech spinning bicycle, for bringing you to the best cardio level you ever experienced. Music, rhythm, strong energy and motivation builder in one exciting class. Get connected with your inner hero for a full body experience of strength and fun –the ultimate couple. This class is known to bring the best out of people, combining force, aerobics, coordination and balance all into one. leveraging the eastern wisdom for creating a strong, flexible lean body with a calm, concentrated enlightened mind. We offer classes from highly professional trainers in all Ashtanga Yoga, Vinyasa Yoga and Hot-Yoga, for your body and your mind. An intelligent exercise form which works gently and precisely on all of your body, giving you strength, endurance, flexibility by meticulous work off alignment and breathing. Elegant and persistent work on your entire body to improve total physical and general wellbeing, ideal for trainees who suffer injuries, as well as for those who wish to have a healthier life.